While on your hands and knees, lift up one arm so that you are supporting yourself with one arm and your legs. Now, shift your weight forward and then back. If too difficult leave both hands on the floor. While on your hands and knees, lift up one arm so that you are supporting yourself with one arm and your legs. Now, shift your weight side-to-side. If too difficult leave both hands on the floor. Lying on your back, holding a weight, straighten your arm towards the ceiling. 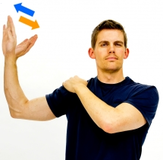 Next, move your arm in small circles in a clock-wise direction. After a few seconds, reverse the direction (counter-clockwise). Change directions every few seconds. Standing at a wall, place your arms out in front of you with your elbows straight. Next, bend your elbows slowly to bring your chest closer to the wall pinching your blades together. 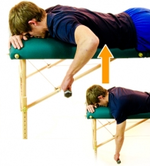 To make this exercise harder do single arm, or push up off a table edge instead of the wall. With you hands rested on a table behind you, lower your body weight bending your elbows. Then straighten the elbows returning to the start position. Draw your shoulder blades back and down. 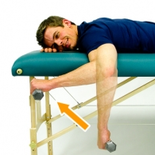 Lie on your affected side and hold a weight with your elbow bent and rested near your side. Raise up the your forearm from the floor / bed surface towards the ceiling (closing the gate). Lying face down with your elbows straight, slowly raise your arms upward while bending your elbows. Your elbows should be approximately 90 degrees away from your side. Pinch your shoulder blades back as you raise your arms. With your arm at your side, draw up your hand by bending at the elbow. Keep your palm face up the entire time. Holding an elastic band with both hands, draw back the band as you bend your elbows. Keep your elbows near the side of your body, pinching your blades together. Lie on your side and hold a weight with your elbow bent and rested on your side. Next, rotate your forearm towards the ceiling (opening the gate). Lie on your stomach and rest your upper arm on the table / bed with your hand hanging down towards the ground. Now rotate your forearm up towards the ceiling. While standing, bend over and support yourself with your uninjured arm. 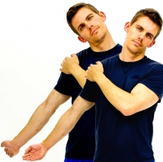 With your affected arm starting at your side, raise up your arm as you bend your elbow. Pinch your shoulder blade as you raise the arm. Lie on your back with your arms extended out in front of your body and towards the ceiling. While keeping your elbows straight, protract your shoulders forward towards the ceiling. Keep your elbows straight the entire time. Lying face down with your arms overhead, raise your arms upward and off the surface towards the ceiling. Place a pillow under your chest, or take the arms out wider as required if you are having difficulty. Lie face down with your elbows straight and arms out to the side (thumbs turned up). Slowly raise your arms towards the ceiling keeping your elbows straight. Pinch your shoulder blades together as you raise your arms. Hold an elastic band with your arm up at 90 degrees away from your side and elbow bent to 90 degrees. Take the arm back as if preparing to throw a ball. Maintain your shoulder blade in a retracted and downward position the entire time. 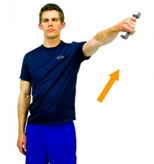 While holding a weight with the thumb pointed downward, bring up your arm up from your side. Try to raise arm no higher than 60 degrees (not 90 degrees+ shown here). This can also be done using an elastic band for resistance. While holding an elastic band at your side with your elbow bent, start with your hand near your stomach and then pull the band away. Keep your elbow at your side the entire time. While holding an elastic band at your side with your elbow bent, start with your hand away from your stomach, then pull the band towards your stomach. Keep your elbow near your side the entire time. Rest your forearm on your thigh or table and bend your wrist upwards with your palm face up as shown. Rest your forearm on your thigh or table and bend your wrist upwards with your palm face down as shown. Rest your forearm on your thigh or table. 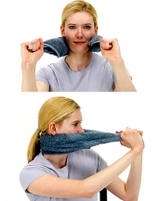 Next, while holding an elastic band, bend your wrist upwards with your palm face down. Slowly lower a hammer towards the inside and then outside of the body as shown. Rest your forearm on your thigh. Next, while holding an elastic band, bend your wrist upwards with your palm face up. 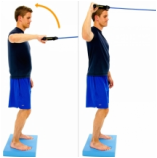 The following physio exercises are designed to strengthen core muscle groups which improve stability around the spine, and shoulder / pelvic girdles. These core muscle groups (such as transversus abdominis, internal and external obliques, and mulifidus) are designed for endurance work, not power and therefore should be trained accordingly. When training these muscle groups aim for longer holds. Start with shorter holds (10 seconds) and build up to longer holds (30 seconds+) over time. Make sure you are not having to hold your breath during core strengthening: this means the activity may be too difficult and will be loading inappropriate muscle groups......try an easier exercise instead. At Dunsborough Physiotherapy Centre we have access to Real-Time Ultrasound: this is a great technology which allows us to watch your core muscle groups working on screen. I recommend all those embarking on a core strengthening / conditioning program to receive training via Real-Time Ultrasound to ensure they are properly engaging their core muscle groups during exercise. Contact us at Dunsborough Physio Centre for more info. 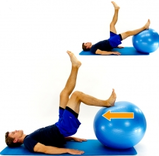 While seated on an exercise ball, raise one leg and opposite arm. Return limbs back down and then raise the opposite side. 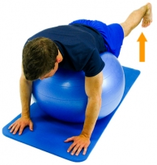 While seated on an exercise ball, slowly raise a foot up off the floor. Return and then lift the opposite side. While lying on your back with an exercise ball under your lower legs, slowly roll the ball side to side to gently rotate your back. Start in a seated position on the ball. Now slowly walk your feet forward so that the ball is on your upper back. Keep your buttocks and pelvis up off the ball and straight with your thighs. Keep your buttocks and pelvis up off the ball and straight with your thighs. Next, raise up one leg so that you straighten your knee in the air. Return it back to the floor and then switch to raise up the other side. 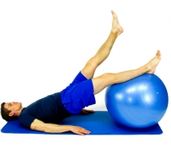 While lying on the floor, place an exercise ball under your lower legs and then raise up your buttocks. 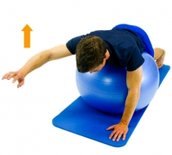 While lying on the floor, place an exercise ball under your lower legs and then raise up your buttocks. While holding this position raise up a leg off the ball towards the ceiling then lower back to the ball and alternate to lift the other leg. Kneel with an exercise ball in front of you. 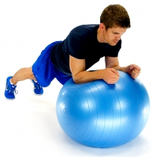 You should be flexed at hips and your elbows propped on the ball. 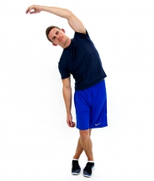 Next, slowly lean forward and allow the ball to roll forward up your arms while maintaining a tight and neutral spine. Now roll Back to starting position. While kneeling on the floor with an exercise ball in front of you, place your elbows and hands on the ball and lift your body up. Try and maintain a straight spine. Do not allow your hips or pelvis on either side to drop. While lying face down over a ball, support your self with your arms and legs. Next slowly raise up a leg. Return leg back to floor and then raise up the other leg. While lying face down over a ball, support your self with your feet and hands. Next, slowly raise up one arm. Return arm back to floor and then raise up the other arm. While lying face down over a ball, support your self with your feet and hands. Next, slowly raise up one arm and opposite leg. Return arm and leg back to floor and then raise up the opposite arm/leg. While lying on your back, use your stomach muscles to press your spine downwards towards the ground. Do not hold your breath. 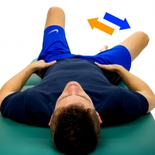 While lying on your back, raise up a knee into and press it into your hands. 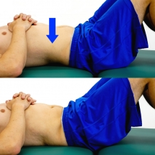 ​Stabilise your spine by bracing your abdominal muscles. ​Do not hold your breath. While lying on your back with both knees bent, stabilise your spine by bracing your abdominal muscles. 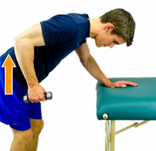 Hold this contraction as you slowly lower one knee to the side. Your pelvis should not move. While lying on your back with your knees bent, slowly slide your heel foward on the floor/bed and then slide it back. Stabilise your spine by bracing your abdominal muscles. 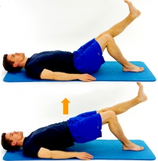 While lying on your back with your knees bent, slowly raise up one foot a few cms and then set it back down. Next, perform on your other leg. Stabilise your spine by bracing your abdominal muscles. While lying on your back with knees bent, straighten out one knee while keeping the leg off the ground. Hold and then return to original position. Next, perform on the other leg. Stabilise your spine by bracing your abdominal muscles. While lying on your back with your knees bent, raise up both feet and straighten one out in front of you. Then return the leg back and straighten the other. Stabilise your spine by bracing your abdominal muscles. While lying on your back with your knees bent, slowly raise up one foot and opposite arm. Return to starting position and then repeat on the opposite side. Stabilise your spine by bracing your abdominal muscles. While lying on your back with your knees bent, extend one knee as shown. Next, raise your buttocks off the floor/bed. Stabilise your spine by bracing your abdominal muscles. While lying face down slowly raise up an arm and opposite leg. Slowly lower and then raise the opposite side. Stabilise your spine by bracing your abdominal muscles. While lying on the floor with your knees bent, slowly raise up and to the side so that your shoulder blade clears off the floor. Keep your arms folded across your chest. While lying on your back with your arms crossed over your chest, partially curl up your trunk and lift your shoulder blades off the ground, then slowly return to lying down position. While in a crawling position, slowly raise up an arm out in front of you. Stabilise your spine by bracing your abdominal muscles. While in a crawling position, slowly raise your leg back behind you as you straighten your knee. Stabilise your spine by bracing your abdominal muscles. While in a crawling position, slowly raise your leg and opposite arm upwards. Your arm and leg should be fully out-stretched. Stabilise your spine by bracing your abdominal muscles. While lying face down, lift up onto your elbows and toes. Try and maintain a straight spine. Do not allow your hips or pelvis on either side to drop. Stabilise your spine by bracing your abdominal muscles. While lying face down, lift your body up coming onto your elbows and toes. Next, lift up one arm and opposite leg. Return to original position and then perform with the other arm and leg. Stabilise your spine by bracing your abdominal muscles. While lying on your side, lift your body up coming up onto your elbow and feet. Try to maintain a straight spine. Stabilise your spine by bracing your abdominal muscles. If too difficult come up onto your elbow and bent knees (rather than elbow and feet). While lying on your side, lift your body up on your elbow and feet. Next, slowly raise up the top most leg upwards, then return. Maintain a straight spine. If too difficult come up onto your elbow and bent knees (rather than elbow and feet). Raise your top bent leg upward, then lower.